In my recent blog post, Digital Transformation – an Existential Threat to the Technological Late and Laggards, I defined digital transformation as leveraging information technology to disrupt traditional industry models and business practices to deliver exceptional customer and business value and create sustainable competitive advantage. Advances in information technology are accelerating at such as rapid pace that organizations that are technological late adopters and especially technological laggards are not simply enabling their more technology adept competitors (often referred to technological innovators and early adopters) to gain an incremental competitive advantage, the late and laggard’s inability, or lack of awareness, to respond to advances in information technology pose an existential threat to the technological late and laggards. Why is “digital transformation” such a hot topic today? Cleary, mobile computing, cloud computing, enterprise application software, software as a service and web service integration are key enablers of digital transformation. These enablers, however, are mainstream at this point - well understood and are already incorporated into the vast majority of organizational and I.T. modernization strategies and solution initiatives. There are, in my opinion, three digital transformation enablers that are not yet as mainstream but are rapidly emerging and being incorporated into the organization and I.T. 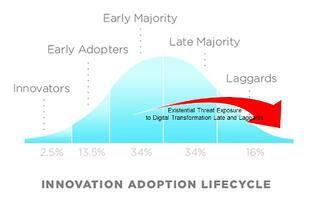 modernization strategies of the technological innovators, early adopters and some of the early majority. These enablers include, Artificial Intelligence & Machine Learning, Big Data & Predictive Analytics and Business Process Automation. In this post I define how Artificial Intelligence (AI) and machine learning disrupts traditional industry models and business practices to deliver exceptional customer and business value to create sustainable (existential) competitive advantage for your organization. This post stands on its own independent of my recent post Digital Transformation – an Existential Threat to the Technological Late and Laggards. However, I encourage you to read my recent post for a richer context to enjoy this post. AI is independent intelligence comprehended by computers. That simple definition of AI is a significant break from the traditional notion of computing where humans develop application code and then input information for the code to deterministically process and provide output in accordance with the rules of the code. AI, however, is able to self-adapt the code and the associated rules and algorithms to achieve a goal. Many articles on AI frequency refer to mechanical mechanisms such as robotics. However, AI lives in software – code, associated rules and especially algorithms. Mechanical mechanisms are just one form of the application of AI. And, perhaps, it’s conceptually easier to speak to the concept of AI by utilizing tangible examples that manifest the everyday use of AI. For example, the concept of self-driving “autonomous” vehicles (cars, trucks, container ships and airplanes) is a wonderful example of the current state of AI and the direction in which AI is moving. Later in this post I will provide business process / business-to-business examples of AI. At one level, autonomous cars utilize traditional deterministic rules-based algorithms for basic driving functionality – obeying the speed limit, stopping at stop signs, proceeding through an intersection if the light is green and if there are no obvious obstructions, and even following the route prescribed based on mapping and GPS algorithms. This type of AI is often referred to a "weak AI" systems that apply defined rules to perform pre-planned moves for a certain purpose. “Strong AI", however, refers to systems that can adapt to new and novel situations. The heart of strong AI is machine learning. 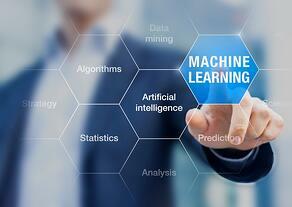 Machine learning refers to the ability for algorithms to make decisions, learn through iterations of applying the algorithms and adapt without being explicitly programmed. Learning, however, requires capturing feedback regarding the quality of the decision. The feedback could be gleaned through human input such as rating a decision on a scale of 1-10 or success vs. failure, or through some type of sensory device that monitors parameters that indicate the quality of decisions, such as g-forces incurred in making a turn in a vehicle. Continuing with the concept of autonomous cars, it’s simply not possible to identify and program for every conceivable variable and scenario – it’s infinite. Accordingly, autonomous cars need the ability to make very sophisticated decisions that traditionally require human knowledge and judgment acquired through experience. For example, distinguishing if an automobile entering the flow of traffic from an on-ramp is going to grant your autonomous car the right of way (as prescribe by traffic rules) or if it is driving sufficiently aggressively that the automobile will swoop-in dangerously close in front of you – or, even more aggressively, not yielding in any way such that your autonomous car will crash into the automobile unless your autonomous car takes mitigating counter measures. Ultimately, the AI of autonomous cars will need to comprehend ethics – perhaps choosing from a set of very bad options – swerving into a crowded playground to avoid a head-on collision or maintaining the course for the head-on collision to avoid swerving into the playground. This concept of splitting the atom of work activities, a concept that I coined in my book Mastering Business Chaos, refers to analyzing work activities performed across the organization, at all levels of the organizational structure, into two types of components – mechanical rules-based components and knowledge and judgment based components. Also see my blog post Digital Transformation – an Existential Threat to the Technological Late and Laggards. Knowledge and judgement oriented tasks and decisions are subjective and therefore require knowledge and judgment based on experience and critical thinking. The splitting of rules-based work from knowledge and judgment based work enables operators and decision makers to focus more time on knowledge and judgment based work. AI enables organizations to go one step, and a very significant step, further in splitting the atom of work activities by automating a portion, perhaps a substantial portion, of knowledge and judgement based work. The result is that by using AI to perform knowledge and judgement work – work traditionally performed manually by highly talented resources, organizations can further razor focus this talent on delighting existing customers, profitability, increased speed-to-market, discovering new customers and markets, eliminating inefficiencies, accelerating the delivery of goods and services, etc. The discussion of autonomous vehicles above provides an interesting and intuitive context for understanding the concept of AI. However, below are some excellent examples of how AI is being used in business today to disrupt traditional industry models and business practices to deliver exceptional customer and business value to create a sustainable (existential) competitive advantage. Think of these examples as a broad brush for inspiration to identify opportunities to apply AI in your organization. Chatbots. 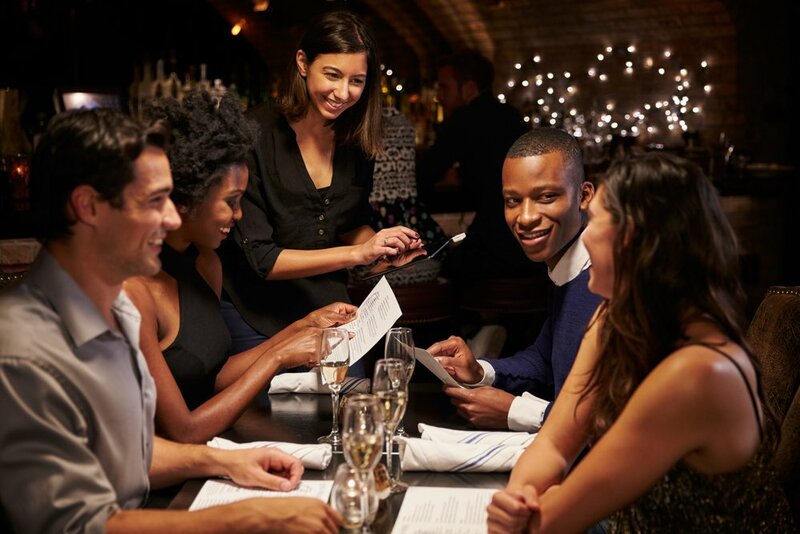 Customer service interactions are time intensive and are frequently a source of customer irritation – particularly when interacting with a customer service agent that has little experience in your matter. Chatbots are increasingly effective in customer service interactions. Chatbots recognize and understand specific phrases in customer requests (typically written requests, but spoken natural language requests are rapidly advancing) and then respond to customers accordingly. Chatbots self-learn as they receive further information and customer requests, enabling them to improve accuracy and conduct conversations more naturally. I also include Apple's SIRI and Microsoft’s Cortana in the category of chatbots – although Apple and Microsoft might disagree preferring to classify SIRI and Cortana as digital assistants. Language Translation. Google provides a text based language translator. Skype is testing a real time speech translator allowing anyone to talk naturally with anyone else. The AI algorithms examine millions of translated sentences and are increasingly proficient in identifying patterns of speech and providing accurate translation. For voice recognition, the AI algorithms breaks down samples of spoken words and phrases, analyzing them until the algorithms achieve a sophisticated grasp of the patterns in which sounds combine to form speech. Client Advisory Services. Financial institutions are offering automated financial advisory services that assist customers in making financial decisions. These include monitoring events and stock and bond price trends against the user’s financial goals and personal portfolio and making recommendations regarding stocks and bonds to buy or sell. These systems are often called “robo advisors”. Claims Management. I recently worked with a client in the insurance industry to develop the business processes and AI based claims management application software to automate the adjudication of claims without involving claim adjustment professionals. The system is able to automatically adjudicate and process approximately 80% of claims by replicating, via AI, the knowledge and wisdom gleaned from many years of manually adjudicating claims. Content Generation. In its simplest form (i.e. weak AI) content generation is performed using structured data. For example, the automatic generation of news articles based on an organization’s financial reports. Content generation from structured data relies on the data being received in a pre-defined format. The frontier of content generation is unstructured data (i.e. strong AI) – the ability for a system to intake information from a variety of unformatted sources such as news articles, white papers, etc., infer new and unique connections and conclusions, and produce coherent content for a human to read. Organizations that are the innovators and early adopters of information technology are already on-board with AI. If digital transformation, including AI & machine Learning, big data & predictive analytics, and business process automation are not yet part of your organizations modernization strategies and solution initiatives - beware! Digital transformation poses an existential threat to your organization.